St John’s College where Rivers spent the majority of the latter half his life, is part of the city’s collegiate system. This means it is a member institution of a university which consists of a number of individual colleges (for more information see http://en.wikipedia.org/wiki/Colleges_within_universities_in_the_United_Kingdom ). Cambridge University began with the founding of Peterhouse in 1284 and is currently made up of 31 colleges, the newest being Robinson, opened in 1977. St John’s, full title “The Master, Fellows and Scholars of the College of St John the Evangelist in the University of Cambridge“, was founded in 1511 from money left in the will of Lady Margaret Beaufort, the mother of Henry VII (she also was responsible for Christ’s founded in 1505). Its was constructed on the site of a 13th century hospital and it aims, in the words of its statutes, are ‘the promotion of education, religion, learning and research’. Accordingly, its alumni include nine Nobel Prize winners, six prime ministers of various countries, three archbishops, at least two princes, and three saints. The crenalated gatehouse, built mainly in Tudor red brick is to be found on St John’s Street in the older part of the city whilst its rear backs onto the Cam, and was, indeed the first to ‘cross’ the river – to have permanent buildings on the opposite bank. The buildings form five main courts. First Court was converted from a medieval hospital on the foundation of the college, and though it has changed, the front range is still mostly the original construction. The southern flank was re-faced between 1772–6 but the largest alteration is the Victorian transformation of the north side in the 1860s. It involved the demolition of the original mediaeval chapel and in its place was placed larger set of buildings. These include the tallest building in Cambridge, the Chapel, designed by Sir George Gilbert Scott, incorporating some pieces from its predecessor. The alteration also gave need for new connecting passageways to First Court; an extra window was added to enlarge the college’s hall, and , lastly, close to the gates, an entirely new construction was built. Described historically as ‘the finest Tudor court in England’, Second Court was built between 1598 to 1602, on the top of the foundations of an earlier, far smaller court which had been demolished. Its designers were Ralph Symons of Westminster, and Gilbert Wigge of Cambridge. Their original architectural drawings are housed in the college’s library, and are the oldest surviving plans for an Oxford or Cambridge college building. It was funded by the Countess of Shrewsbury, whose arms and statue stand above the western gatehouse. The oriel windows are a striking feature, though this gatehouse, built merely as a mirror image of the college’s Great Gate containing a statue of the benefactress, added in 1671. Behind the oriel window of the north range is a Long Gallery, a room fashionable at the time, like that generally used in aristocratic houses for the pursuit of exercise in bad weather. Prior to its segmentation,it spanned 148 feet in length. It was in this room, that the treaty between England and France was signed that established the marriage of King Charles I of England to Queen whilst during the 1940s, parts of the WW2 D-day landings were planned there. One now enters this section of the college from Second Court through Shrewsbury Tower which from 1765 to 1859 housed an observatory. Each flank of the Court displays a different style of architecture. Following the insertion of the college library which it contains in 1624, the final sides of Third Court were not completed until the period between 1669 and 1672, when the college had recovered financially and emotionally from the Civil War. The additions included a fine set of Dutch-gabled buildings backing onto the River Cam, and a ‘window-with-nothing-behind-it’ that was designed to solve the problem of connecting the windowed library with the remainder of the court. In the early 19th century St John’s saw a large increase in its number of students and as time went on, it became obvious that more accommodation would be required to house them all. The college originally decided it would have built a copy of Second Court to keep the architectural integrity but in the end they were persuaded to do otherwise. Thomas Rickman and Henry Hutchinson submitted plans for a neo-gothic ‘romantic’ style structure and these were those accepted. Consequently, work began in 1826 and when completed in 1831, the court became the first building of any Cambridge college to be situated on the west side of the Cam. That the clock tower in New court has blank faces is a mystery to many. A popular theory was that there was at some point a restriction on the amount of striking clocks in the town but no evidence of this has been found to exist. Another, related, story is that there was a contest between St John’s and Trinity College which is located next along the street concerning who could build the tallest (at the time) clock tower with the winner being allowed to retain its clock – Legend states that Trinity was triumphant so St John’s remained incomplete. This may be all well and good except that Trinity’s version ( in King Edward’s Tower) was constructed two hundred years before New Court…There is, however, still something of a link: the clock is famously a ‘double striker’ and emplaced by the Master of the time who decreed that it would strike once for Trinity and once for st John’s which was his old college. The most likely explanations of all is rather more straightforward: that the architect feared that actual working faces would spoil the neatness of the tower, and/ or that some kind of unforeseen financial problem led to it never being completed. Chapel Court lies to the west of the chapel tower itself, the shorter side facing onto Bridge Street. It was built around 1938, along with North Court and Forecourt (opening onto the street) to once again increase that college’s capacity. ( http://en.wikipedia.org/wiki/Pershore_Abbey) for the tower and the Church of Saint Chapelle in Paris, France ( http://en.wikipedia.org/wiki/Sainte-Chapelle ) for much of the rest. Work was completed in 1869 and the exterior of the chapel can be viewed today from the corner of St John’s Street and performances by the world renown choir can be heard throughout the year, particularly popular at Christmastide. “The benefactor Henry Hoare offered a down-payment of £3000 to finance the chapel’s construction, in addition to which he promised to pay £1000 a year if a tower were added to Scott’s original plans, which had included only a small fleche. Work began, but Mr Hoare’s death in a railway accident left the college £3000 short of his expected benefaction. The tower was completed, replete with louvres but left without bells. It is based on Pershore Abbey. The tower is 50 metres high, and is the tallest structure in Cambridge (followed by the Cambridge University Library and King’s College Chapel). The Chapel’s antechamber contains statues of Margaret Beaufort and John Fisher. Inside the building is a stone-vaulted antechapel, at the end of which hangs a ‘Deposition of the Cross’ by Anton Rafael Mengs, completed around 1777. The misericordes and panelling date from 1516, and were salvaged from the old chapel. The chapel contains some fifteenth-century glass, but most was cast by Clayton and Bell, Hardman, and Wailes, in around 1869. Freestanding statues and plaques commemorate college benefactors such as James Wood, Master 1815–39, as well as alumni including Thomas Clarkson and William Gilbert. 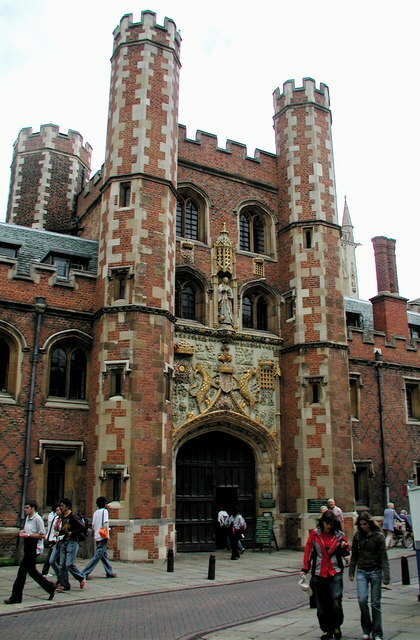 The college tower can be climbed, and is accessed via a small door on First Court. Two statue plinths were left empty and still bear no occupant. Whether there was no one left whom the college wished to commemorate , whether they were for people who had promised money and failed to pay or if they were left ready for future occupants is not known. The chapel is not the only part of St John’s where you will find elaboration. The dining hall was given a hammer-beam canopy, picked out with amorial symbols of its benefactors. The primary structure shows panelling up to the windows in linenfold style dating from 1528-9 ; there is a screen originally extending five bays but later being lengthened to eight, again by Gilbert Scott in 1863. Its windows also hark to different eras, with dates ranging from the fifteenth to nineteenth centuries. One can see a device of Royal Arms set above. This is probably due to the presence of Elizabeth I, apparently arriving in the room on horse-back during a state visit to the town (Contrary to popular belief, Cambridge was not a city until 1954) in 1564. The Old Library built in 1624, was funded mainly by an anonymous donor who gave £1200. He was afterwards revealed to be the Bishop of Lincoln later of York, John Williams (1582-1650) who then donated a further £811 – a considerable chunk of the full (£3000) costs. His generosity is commemorated on the bay window with a fine view of the Cam – the initials ILCS being an abbreviation for the Latin ‘Iohannes Lincolniensis Custos Sigilli’ ; ‘John of Lincoln, keeper of the Seal’. These donations were not his only influence – once again the college was not to be allowed its intended design for a building – instead of a portico-ed classical structure, Williams’ tastes ran along more traditional lines and the result is neo-gothic, in fact, one of the earliest examples. 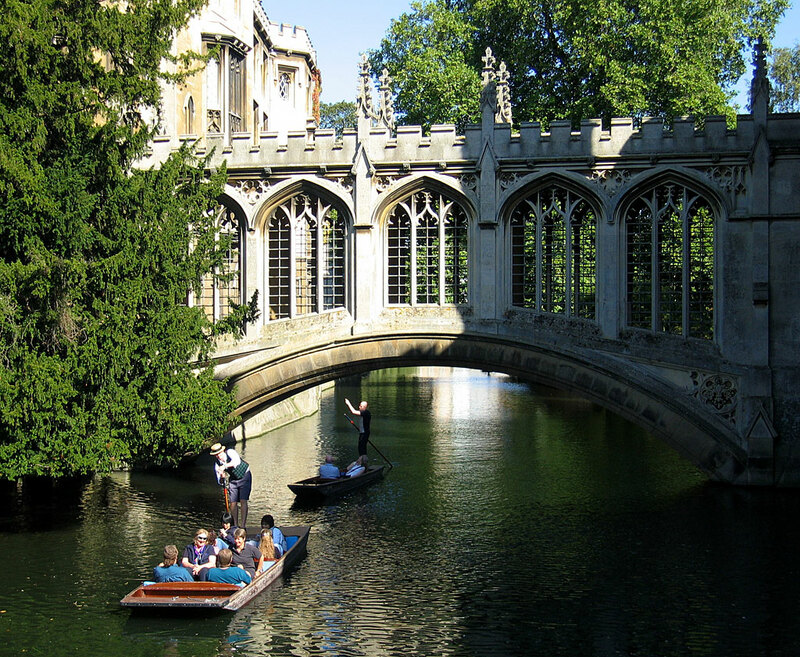 St John’s has its very own Bridge of Sighs; first called New Bridge since it linked Third Court to New Court and not particularly built in resemblance of the original in Venice, by legend it earned its tenuous nickname from being on the route which took reluctant students to and from their exams. The Italian original took convicts to their fate in prison. Considered by Queen Victoria as ‘so pretty and picturesque, it is one of the most common sights of Cambridge both in literature and tourist photos and was her favourite location in the town. Dating from 1831, it is of a single span construction and, once again, by Henry Hutchinson in neo-gothic and consists of a covered walkway above the base with delicately traceried openings whilst the east end proffers a three bay arcade. Standing south of Northampton Street, the School of Pythagoras was built in the 1200s, prior to the establishment of the earliest college in Cambridge University. It was originally the private home of the Merton family and the reasons behind its name is sadly lost to time. Ironically, from 1266 – 1959 it was owned by Merton College, Oxford but now houses St John’s College Dramatic Society and is used as a theatre . It is the college’s oldest structure and the earliest secular building in the entirety of Cambridge. (13 July 1527 – 1608 or 1609) mathematician, astronomer, astrologer, geographer, and consultant to Queen Elizabeth I whose career was largely devoted otherwise to the study of alchemy, divination and Hermetic philosophy. He gave the first clinical description (1768) of angina pectoris and demonstrated that chicken pox was different from smallpox. In 1746 he became a fellow of the Royal College of Physicians in London; and two years later he settled in London, where he was elected a fellow of the Royal Society in 1749. At the age of seventy-two he partially retired, spending his summers at a house he had taken at Windsor, but he continued to practice in London during the winter for some years longer. In 1778 he was made an honorary member of the Paris Royal Society of Medicine. Homo habilis is a species of the Hominini tribe, which lived from approximately 2.33 to 1.44 million years ago, during the Gelasian Pleistocene period. While there has been scholarly controversy regarding its placement in the genus Homo rather than the genus Australopithecus, its brain size has been shown to range from 550 cm3 to 687 cm3, rather than from 363 cm3 to 600 cm3 as formerly thought. These more recent findings concerning brain size favor its traditional placement in the genus Homo, as does the need for the genus to be monophyletic if H. habilis is indeed the common ancestor. English writer, humorist, and dramatist. Adams is best known as the author of the much loved almost classic The Hitchhiker’s Guide to the Galaxy, which originated in 1978 as a BBC radio comedy. Adams also wrote Dirk Gently’s Holistic Detective Agency (1987) and The Long Dark Tea-Time of the Soul (1988), and co-wrote The Meaning of Liff (1983), The Deeper Meaning of Liff (1990), Last Chance to See (1990), and three stories for the television series Doctor Who. A posthumous collection of his work, including an unfinished novel, was published as The Salmon of Doubt in 2002. (7 April 1770 – 23 April 1850) is now considered one of the most important English Romantic poet whose work is studied by schoolcholdren in the UK every years. He wrote ******. He is also acredited with helpingto launch the Romantic Age in English literature with ajoint publication beside Samuel taylor Coleridge Lyrical Ballads (1798). Wordsworth’s magnum opus is generally considered to be The Prelude, a semi-autobiographical poem of his early years that he revised and expanded a number of times. Wordsworth was Britain’s Poet Laureate from 1843 until his death in 1850. He also underwent missionary work in India and was convinced of the importance of religion, morality and education. He championed causes and campaigns such as the Society for the Suppression of Vice, British missionary work in India, the creation of a free colony in Sierra Leone, the foundation of the Church Mission Society, and the Society for the Prevention of Cruelty to Animals. His underlying conservatism led him to support politically and socially repressive legislation, and resulted in criticism that he was ignoring injustices at home while campaigning for the enslaved abroad. Fisher was executed by order of Henry during the English Reformation for refusing to accept the king as Supreme Head of the Church of England and for upholding the Catholic Church‘s doctrine of papal primacy. He shares his feast day with St. Thomas More on 22 June in the Roman Catholic calendar of saints and on 6 July in that of the Church of England. (ca. 1537 – 15 October 1584), also known by his anglicised name, Richard White, was a Welsh school teacher. He was martyred by being hanged, drawn and quartered for high treason in adhering to his Catholic beliefs in 1584. He was canonised by Pope Paul VI in 1970 as one of the Forty Martyrs of England and Wales. His feast day is celebrated on 17 October. (28 June 1557 – 19 October 1595) was an English nobleman. He was canonised by Pope Paul VI in 1970, as one of the Forty Martyrs of England and Wales. He is variously numbered as 1st, 20th or 13th Earl of Arundel! Howard, as did many of his family, remained Catholic recusants during the reign of Queen Elizabeth and tried to leave England without leave. He was committed to the Tower of London on 25 April 1585. While charges of high treason were never proved, he spent ten years in the Tower, until his death of dysentery. He was never told there was no death warrant against him and spent many years in fear, mainly given company by a friendly dog. Another prisoner at the time was the priest Robert Southwell. Although these two great men never met, Philip’s dog helped them to deepen their friendship and exchange encouragement in each other’s plight. Philip loved his pet, who is remembered along with him in a statue at Arundel Cathedral.